Westwide SNOTEL basin-filled map February 14, 2018 via the NRCS. According to the Natural Resources Conservation Service, the Yampa River basin has received 73 percent of the average amount of snow it typically receives by this time of year. The Little Snake River basin has received 72 percent. In river basins in the southwest and south central part of the state, this number is in the 30s. 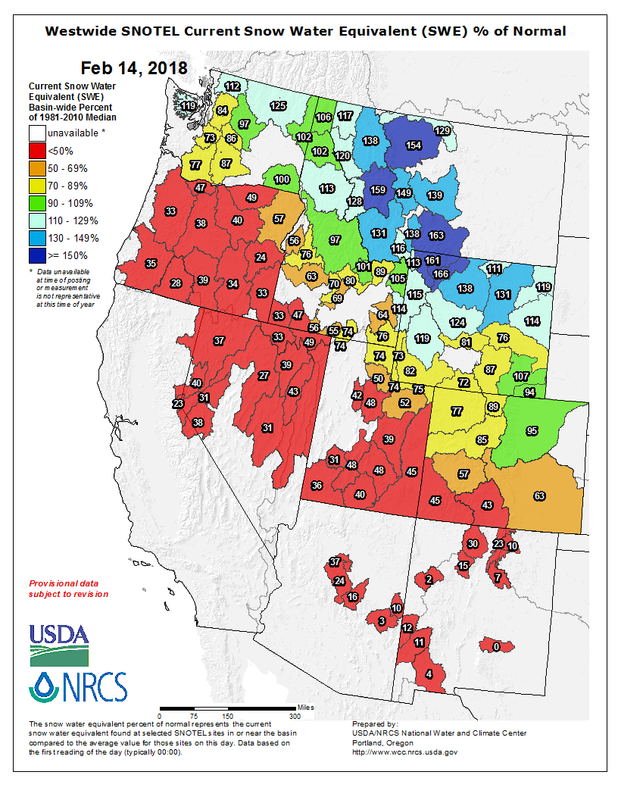 The drastic difference in snowpack between the northern and southern parts of the state is thanks to the La Niña winter. La Niña is a weather phase that cools the waters of the Pacific. A La Niña year influences weather patterns around the globe, but in the United States, it creates a ridge of high pressure in the West. Storms develop in the moist air of the Pacific Northwest, then ride the jet stream on the northern edge of this high-pressure ridge. National Weather Service meteorologist Megan Stackhouse calls these storms “northern clippers.” They typically hit only the northern edge of Colorado. According to the U.S. Drought Monitor, all of Colorado (except a sliver at the northern edge, containing Larimer and Jackson counties) is facing drought or near-drought conditions. Eastern Moffat County is abnormally dry, which is a pre-cursor to a drought designation. West of Maybell, the county is in a moderate drought. Steamboat Springs is also in a moderate drought, which could have implications for Moffat County, as snowpack in the Park Range melts into Moffat’s water supply. Stackhouse said it would take 40 to 60 inches of snow for the Yampa/White River basin to reach an average level of precipitation for this water year. Receiving that much snow is not out of the question, though it’s unlikely. Gray and others at the Colorado River District are worried about meeting obligations under the Colorado River Compact. Under the agreement, the state of Colorado is required to contribute a 10-year rolling average amount of water downstream to the Colorado River system to help fill reservoirs such as Lake Powell. So far, Colorado is set to contribute about 40 percent of its average annual contribution, according to Jim Pokrandt, director of community affairs at the Colorado River District. 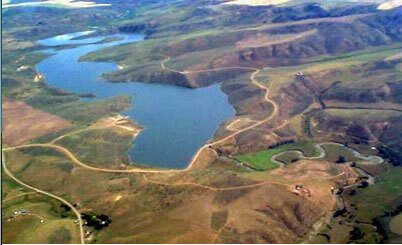 Closer to home, the Stagecoach and Elkhead reservoirs are on track to be filled. These reservoirs are relatively small, however, which makes them easier to fill. But unless more snow comes, rural Moffat County is likely to feel the impact. “If you start the spring with not-very-good soil moisture levels, and then, through April and May, if we don’t get rain to get some soil moisture, you’re that much drier,” Gray said. For farmers, this could mean a weaker hay crop, as water to irrigate isn’t there. Dry soil also means dry grasses, which are better fuel for wildfire. For now, residents of Northwest Colorado can kick off their snowshoes and hope to receive more moisture to avoid a drought. The weekend snowstorms helped. 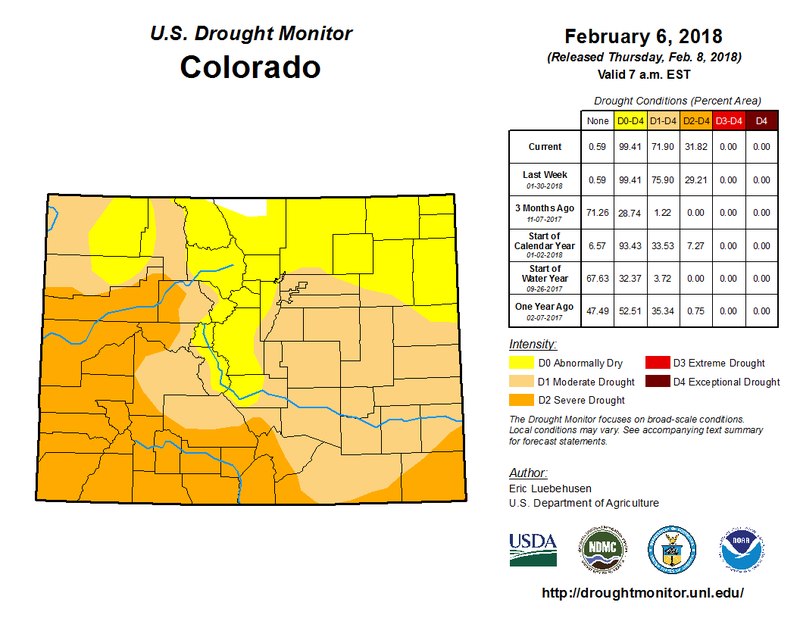 Colorado Drought Monitor February 6, 2018. Installed last September, a net designed to keep non-native, predatory fish at Elkhead Reservoir from entering the Yampa River appears to be fulfilling its purpose, though it may be too soon to tell. This spring, Colorado Parks and Wildlife conducted its first count of the two species of concern, northern pike and smallmouth bass, in the stretch of water between the net and the spillway, where water leaves the reservoir and enters Elkhead Creek, which feeds into the Yampa. “In our first sample this spring, we didn’t see any indication that the net was failing,” said CPW Aquatic Biologist Tory Eyre. The count was taken before the reservoir filled with spring runoff and water began spilling over the spillway. Another count taken this fall, after the reservoir is done spilling, will give biologists an even better idea of how the net is working. Officials are hoping the net, made of a sturdy polyethylene mesh, will hold up to any debris that gets swept its way, and divers will check and clean the net once a year. The life span of the $1.2 million net is only estimated at about seven years, Eyre said, which is why CPW is also hoping to check northern pike and smallmouth bass populations through its new, annual Elkhead Reservoir Fishing Classic. The four native fish involved with the program are the Colorado Pikeminnow, Bonytail, Humpback Chub, and Razorback Sucker. 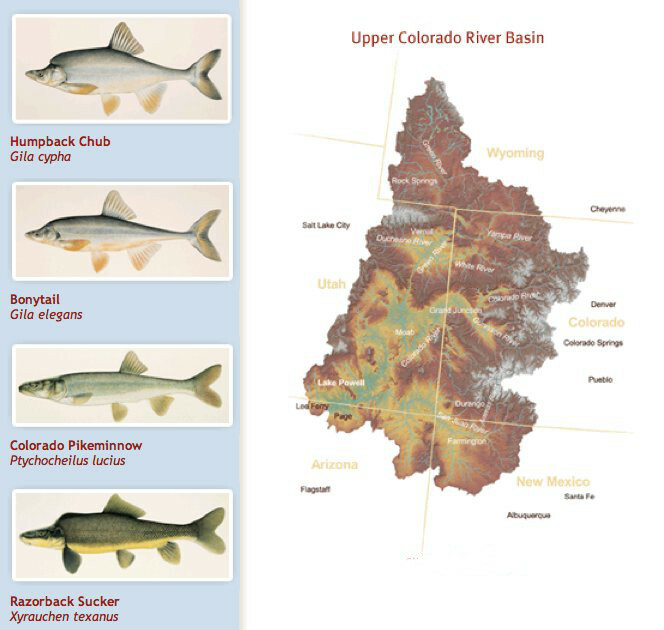 As these unique fish are found only in this part of the world, the Colorado River Basin, the decline is due to the loss in habitat and several non-native fish species preying on them, including Small Mouth Bass, Northern Pike, and Walleye. “The fish that we’re trying to remove compete for resources with the native fish as well as they are predatorial fish and they’ll eat the native fish as well,” said Tory Eyre, Aquatic Biologist with Colorado Parks and Wildlife (CPW). These non-native fish are coming into these native fish habitats from reservoirs overflowing and from a way that is a bit more unorthodox. “People are moving live fish from one body of water to another and that is illegal on the West Slope of Colorado, and when we have folks that are doing that, it results in a lot of our time and dollars to try to eradicate those species from areas in places that we don’t want them to be,” said Lori Martin, Senior Aquatic Biologist with CPW. CPW has also worked with other program partners to install spillway screens in reservoirs at Elkhead and Highline Lake State Parks to prevent non-native fish from escaping into the Yampa and Colorado Rivers. “It allows us to stock warm water fish that are okay with the recovery program into Highline Lake and the purpose of it is to keep those fish in the lake and not allow them to get in the Colorado River,” said Alan Martinez, Park Manager for Highline Lake State Park. As this is upsetting to some anglers, CPW has been working with the program’s agencies, and with anglers, to address their frustrations. “We’re trying to provide opportunities for anglers for similar species in waters or areas where there is no interaction with native fish,” said Martin. To encourage involvement by the angling public, CPW is sponsoring the Elkhead Reservoir Fishing Classic Tournament from June 24-July 2 in Craig. “The aim is to have anglers help us remove small mouth bass and northern pike so we that can better provide a compatible sport fishery that’s in line with endangered fish recovery efforts downstream,” said Martin. With all of the efforts in helping to reduce the non-native fish to increase the native fish populations, CPW officials say some improvements with some species have already been made in some locations along the Western Slope. “This is kind of our one chance to recovery these species. They’re not found anywhere else, so if they’re gone, then they’re gone, and they’re gone forever,” said Eyre. The tournament is hosted by CPW, and it is offering over $6,000 in prizes, but the effort is part of the Upper Colorado River Endangered Fish Recovery program. To prevent further federal involvement, the recovery program was formed in 1988 to provide endangered species act compliance and keep water development projects closer to the local level. Three states — Colorado, Utah and Wyoming — along with a multitude of federal agencies and private organizations formed the recovery program to help improve fish populations of the endangered humpback chub, Colorado pikeminnow, razorback sucker and ponytail. The program’s actions are dictated by the U.S. Fish and Wildlife Service, but it still provides an important buffer between state and federal government. If the program fails and is dissolved, an individual who draws water from the Yampa River would have to justify their use and provide evidence that their use does not impact endangered fishes — a task the recovery program currently completes. Sherman Hebein, CPW’s senior aquatic biologist for the northwest region, said his organization is hosting the tournament at Elkhead and offering serious prizes because it is important to engage the public in the effort to control non-natives. Elkhead Reservoir is home to nonnative northern pike and smallmouth bass, making it a popular fishery for anglers from across Colorado. But the same nonnatives that attract anglers to the reservoir eat the four fish the recovery program is trying to save. “The objective of this tournament is to suppress these fish, smallmouth bass and northern pike, to reduce the impact of those fish on the Yampa River,” Hebein said. Hebein said protecting these fish easily approaches philosophical debate but genetic diversity is an important thing to protect. Until humans have a better understanding of DNA and what makes us tick, it is crucial to preserve all iterations of life, Hebein said. “Until we can figure that out, we really need to conserve the DNA of all these living organisms because we don’t know how to make it,” he said. But some are still opposed to a tournament that would potentially reduce the fishery in Elkhead Reservoir. Steve Smith, Craig local and longtime Elkhead angler, had a sign posted in protest of the tournament at the turn off to the launch ramp. Despite their differences, Smith and CPW officials were able to interact with respect. Smith understands that CPW has objectives to complete and CPW officials understand Smith’s passion for his hometown fishery. Hebein said CPW is not out to kill the fishery, like many locals believe. “We’re here to turn this lake into a far better fishery but to do that we have to suppress the numbers of big predators,” he said. Hebein and CPW spokesman Mike Porras both said that without their efforts, Endangered Species Act compliance would be out the window and federal intrusion into local affairs would be even greater. The rest of the fishermen were from Grand Junction, Eagle or Rifle. The tournament ends on June 19 with daily prizes for smallest, biggest and most fish caught. Catching a fish with a tag enters anglers into a raffle for big prizes, with the top prize being a new boat. …the Upper Colorado River Endangered Fish Recovery Program’s latest high-priority objective — reducing or eliminating nonnative predators from Elkhead Reservoir — has local fisherman in an uproar. Elkhead Reservoir, which averages 130,000 people visiting during recreation days per year, is home to nonnative northern pike and smallmouth bass, making it a popular fishery for anglers from across Colorado. Upper Colorado River Endangered Fish Recover Program Director Tom Chart said right now, the program’s biggest obstacle is managing nonnative fish, which prey on endangered fish and prevent populations from thriving. “The greatest threat that we are dealing with right now is these nonnative, predatory fish,” he said. Chart said that after ramping up attempts to control nonnatives living in the river, it has been become increasingly clear that source populations must be dealt with. “Elkhead, unfortunately, I understand is a prime fishing location for some of the locals out there, but the amount of escapement of smallmouth bass and northern pike (into the Yampa River) is just intolerable,” he said. Longtime fisher and Craig resident Burt Clements said he understands that under federal law the fish need to be recovered, but he doesn’t think Elkhead is the problem and rather than eradicating nonnatives, other approaches should be the priority. “Until they start a real stocking program in the upper Yampa with adult pike minnow, they probably will not recover them in the Yampa River,” he said. 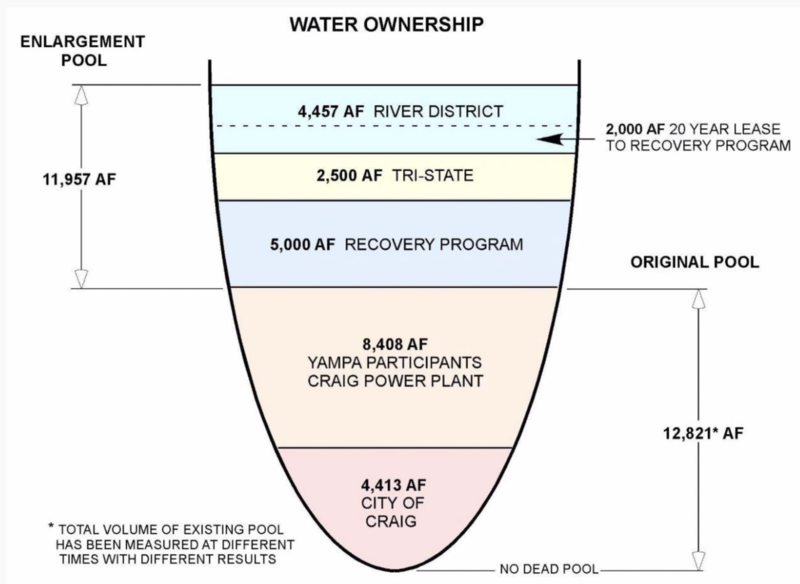 In 2015, the program spent about $1 million on recovery projects in the Yampa River, according to recovery program deputy director Angela Kantola. Efforts did include shocking nonnative fish in the Yampa. “That total certainly exceeds $1 million when support activities (outreach and program management) for Yampa Basin projects are included,” Kantola wrote in an email. To address the root of the nonnative problem — Elkhead Reservoir — the recovery program is installing a net on the reservoir to help prevent spillage of predatory nonnatives into the Yampa where the endangered fish live and thrive. The cost of installation, which is scheduled for this fall, is estimated at $1.2 million. The Colorado Water Conservation Board is contributing $500,000 and the rest of the funding comes from the U.S. Bureau of Reclamation on behalf of the recovery program. The program also is recruiting civilians for assistance. A nine-day fishing tournament offering prizes totaling about $6,000 is scheduled to recruit anglers for the purpose of purging the lake of pike and smallmouth. The tournament begins Saturday and ends June 19. The boat ramp will be open from 6:30 a.m. to 9:30 p.m. but anglers are welcome to stay on the reservoir overnight. If a participant catches a tagged fish, they are entered in a drawing for the top prizes, including a brand-new boat. Colorado Parks and Wildlife Senior Aquatic Biologist Sherman Hebein said the initial plan was to lower water levels in the lake and poison the fish population with rotenone. However, that approach turned out to be unpopular and unfeasible. Despite the hefty prizes, local fishermen are boycotting the tournament. Smith said reducing the fishery at Elkhead would have a negative economic impact on Craig. Allen Hischke, another Craig local, expressed concerns about what he sees as intrusive and unnecessary and government involvement. His thoughts are that Elkhead should be left alone. The recovery program’s nonnative fish coordinator Kevin McAbee said providing Section 7 compliance is where most of the general population should recognize the importance of the program. Moffat County Commissioner John Kinkaid said he supports the local fishermen and hopes for a reasonable compromise ensuring a successful recovery and the preservation of Elkhead’s fishery. Residents of Craig and the surrounding areas will have the opportunity to discuss the Upper Colorado River Endangered Fish Recovery Program and Elkhead Reservoir fish management with several key partners during an open house, Thursday, Feb. 5, beginning at 6 p.m. at Craig City Hall, 300 West 4th Street. The open house format will allow program representatives to answer questions and provide information about the multi-faceted program and its goals of protecting four endangered native fish – the Colorado pikeminnow, humpback chub, bonytail and razorback sucker – found only in the Upper Colorado River Basin. Among the various topics up for discussion will be how Elkhead Reservoir’s predominantly non-native fishery affects local native fish populations, and actions that Recovery Program partners are taking to manage non-native fish populations in the Yampa River and throughout the upper Colorado River basin. According to principal investigators working on native fish recovery, escapement of non-native fish such as northern pike and smallmouth bass, found in significant numbers in Elkhead Reservoir and several other waters in Western Colorado, are among the primary obstacles to the full recovery of the endangered fish. Recent reports that the reservoir might be drained and chemically reclaimed to remove the non-natives led to much discussion and concern in the community; however, at a joint workshop with Moffat County Commissioners and the Craig City Council last December, Hebein announced that CPW and its partners are implementing the installation of a net across the reservoir’s spillway to reduce the number of northern pike and smallmouth bass that escape into the Yampa River. Netting the spillway would provide time to implement other non-chemical management actions to reduce the numbers of smallmouth bass and northern pike in the reservoir. Hebein says that the public will have the opportunity to provide both written and verbal comments during the meeting. More endangered/threatened species coverage here.